Update: 0700 5-1-08 - News and Notes - Santa Anita Fire (CA-SMD-08-22735) fire has burned 584 acres and is 93 % percent contained . Unified Command with USFS (Fiorella) and Sierra Madre (Heydorf) continues. The fire will be transitioning back to the local district on Friday, May 2nd at 0800. Remaining resources continue to improve line, mop-up, and provide structure protection. With cooler temperatures predicted and good progress made by crews, it is anticipated that containment will be achieved on May 2nd at 1800 hours. Acreage apportionment: USFS=248 acres and Sierra Madre=346 acres. With cooler temperatures and good progress by fire crews, it is anticipated that the fire will be contained by May 2nd at 6:00 p.m.
As of Wednesday, April 30, 2008, 6:00 p.m. PST, the Santa Anita Fire has burned 584 acres north of Sierra Madre, CA. 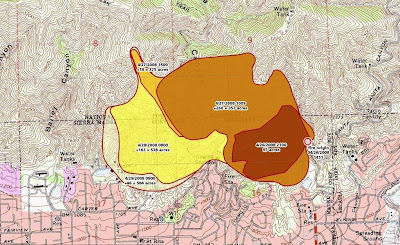 Approximately 238 acres are on National Forest System land within the Angeles National Forest, and 346 acres are within the corporate boundary of the City of Sierra Madre (see fire progression map posted to this site). The fire is currently 93% contained. The Angeles National Forest Fire Information Center will close tonight at 8:00 p.m.
Beginning Thursday, May 1, 2008, fire information will be available during regular business hours, from 8:00 a.m. until 4:30 p.m., by calling 626-574-5208. The City of Sierra Madre Public Information can be reached at 626-355-7135. All evacuated areas, including the Chantry Flat area, have been re-opened without restrictions. Sierra Madre public schools (both campuses) are open. Most other schools in Sierra Madre are also open. Please contact private schools directly to confirm the status of individual school closures. Santa Anita Canyon Road (Chantry Flat Road), which accesses the Angeles National Forest, is open. All evacuated areas including Chantry Flat have been reopened without restrictions. Crews will continue to improve fireline, mop up, and provide structure protection.